I am already up to my ears in boiled eggs. In my household, we get an early start dying eggs so by the time Easter rolls around, I’ve been through three of four dozen. I have to get creative with ways to use them. Since small bites, crostini and toast appetizers are so popular, I thought I’d transform my boiled eggs into a variety of those for Easter. You can serve these as appetizers or make them after Easter for a casual dinner. I have several suggestions because they are so easy. Most of these recipes were made with a loaf of pre-sliced Italian bread; I simply popped the slices in the toaster instead of using the oven. It was so quick and easy. The serving sizes assume you use an Italian loaf; a baguette would yield more portions. If you read my column last week, you saw my deviled eggs with Yum Yum sauce. Those were so divine I wanted to transform it into an egg salad. I served it on toasted bread as an appetizer, but you can serve it as a sandwich, too. For low carb eaters, serve it on a slice of cucumber or daikon. I love avocado toast so that was a must on the menu. It takes half an avocado for a piece of toast so this recipe only makes two slices. I simply topped the avocado toast with chopped eggs, bacon, diced grape tomatoes and salt and pepper. It was so simple and delicious. This is a great breakfast option. A very popular choice was the simplest recipe of all: I toasted Italian bread, smeared store bought pimento cheese dip on it, topped it with sliced eggs, salt and pepper and a sweet and spicy pickle. It was a huge hit. Be sure to add salt and pepper to your eggs once the egg is one the bread. Another simple recipe was one I topped with onion and chive cream cheese, sliced eggs and tomatoes, salt and pepper and drizzled it in balsamic vinegar. Lastly, I chopped eggs, bacon and tomatoes and tossed it all in a store bought honey mustard dressing. Then I topped the toasted bread with romaine lettuce and served the egg concoction in the middle. It was fantastic. You could make it low carb by serving it in lettuce like lettuce wraps. Hopefully this gives you plenty of options to use your eggs this Easter. I hope you enjoy the recipes. Mix all ingredients. Add salt and pepper to taste. Serve on toasted bread. Toast the bread. Peel and slice the eggs. Spread a generous amount of pimento spread on each piece of toast. Top with eggs. Add salt and pepper. Top with one or two slices of sweet and spicy pickles. Peel avocado and smash it with a fork. Add cumin and salt and pepper to taste. Divide it between two slices of toasted bread. Chop egg and tomatoes. Divide between avocado toast and top with bacon. Serve. Peel and chop eggs. Set aside. Chop tomatoes and toss with eggs and bacon. Add honey mustard dressing and toss to coat. Add more, if desired. Spread a piece of lettuce over the toasted bread. Top with egg filling and serve. Toast the bread and then top with a very generous smear of cream cheese. Slice the boiled eggs and divide the slices between the bread. Add sliced tomatoes. Add garlic salt and pepper to taste. Drizzle with balsamic glaze and serve. This entry was posted in Appetizers, Easter and tagged appetizers, avocado toast, boiled eggs, crostini, deviled eggs, Easter, easy, Entertaining, fast, leftovers, pimento, simple on April 17, 2019 by Juliana Goodwin. The past three weeks have been insane! I’ve been working like crazy. I finally handed my first cookbook off the publisher and it should be printing soon. Aside from that, I’ve taken on a ton of food writing this month. The holidays are good for food writers, but I’ve neglected my column. So here are some last minute Halloween ideas for your party tonight. For me, creativity is key when celebrating. I don’t want to spend a ton of money, so I immediately hit a dollar-type store before I do any other buying. Then I supplement with merchandise from bigger retailers. It’s amazing what you can find for $1 to use for a party. One of my favorite finds was a bag of plastic assorted spooky rings (a mix of spider, skulls and bats). 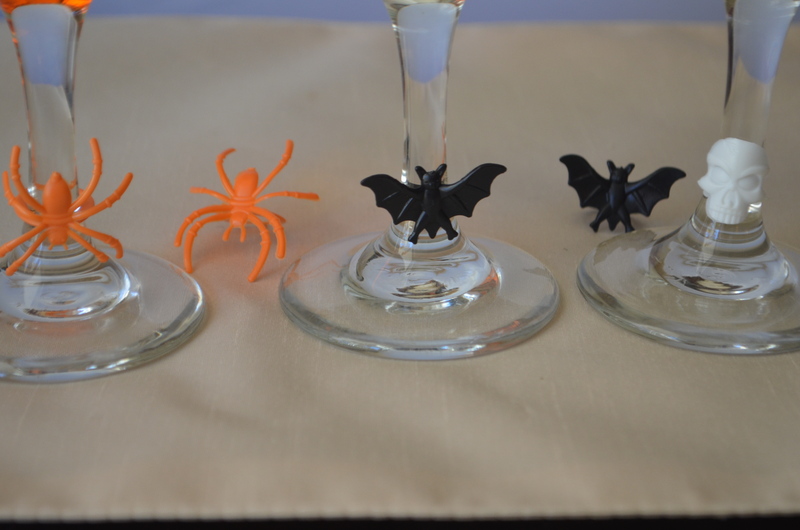 I use the rings around the stem of a wine glass to decorate it; use them to top cupcakes; glue them to a sturdy toothpick (the plastic variety) to skewer meatballs or fruit; use them to decorate food plates (just be sure it’s obvious this isn’t edible). You can also dangle plastic spiders from the ceiling on dental floss; place them in cobwebs; or cut a sliver into a pumpkin or winter squash and have the spiders climbing all over the pumpkin, which is how I serve one of my recipes this week. An idea I saw online was to freeze ice in plastic gloves and then use those to chill punch. You can also fill plastic gloves with candy or popcorn to serve. I like to add a splash of food color to drinks. I’ve found that a few drops of food dye to Moscato doesn’t seem to affect the flavor. I’ve tried other dry wines and it does change the taste; I think this works in Moscato because the wine is sweet. Just empty a bottle of Moscato into a pitcher and add 3 drops of red dye and 6 drops of yellow and stir. You can adjust the color as needed with more dye. I’ve also added food dye to margaritas and it doesn’t change the taste either. 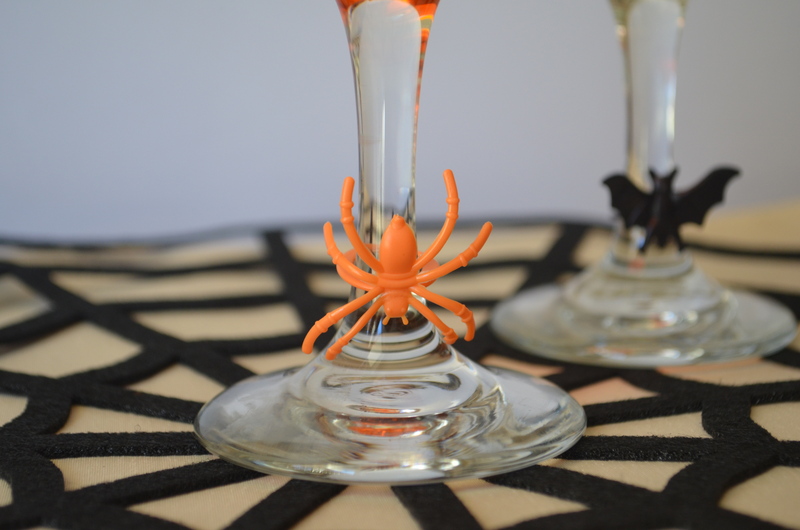 If you serve orange margaritas, rim the glass in green salt and place a spider ring on the stem of the glass. Take your favorite hummus recipe and spread it on a plate (store-bought is fine). Then buy a jar of roasted red bell peppers and puree 1 of the pepper without liquid. 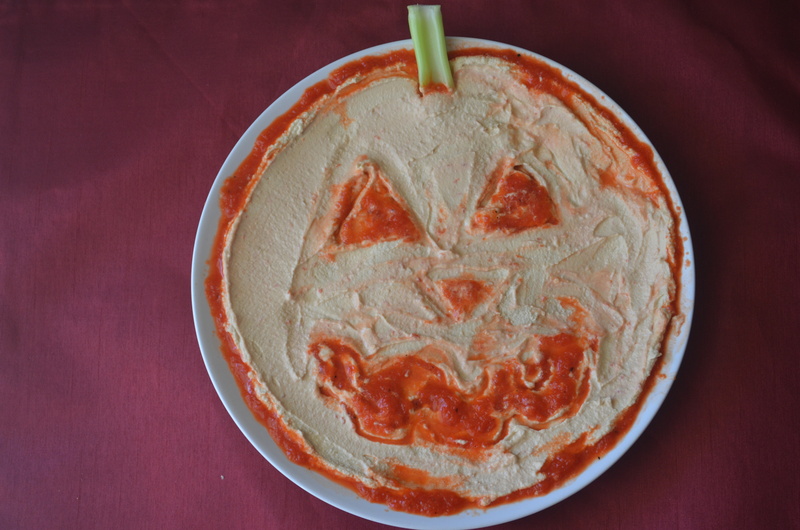 Place in a piping bag and make a pumpkin face on the hummus or a scary face. You can add a celery stick to the top of its head to look like a stem. The flavor of the roasted pepper is great with hummus. It can be a little runny, so if you want to make a bloody looking creature this will serve you well. 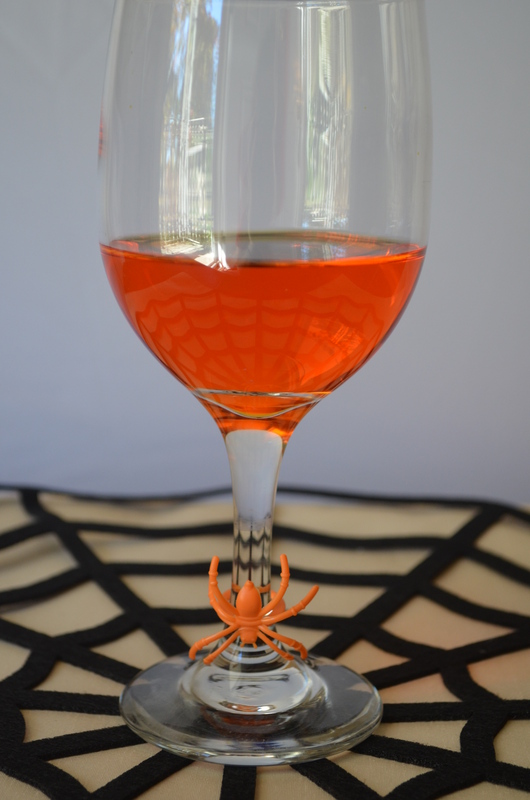 This entry was posted in Entertaining and tagged appetizers, cheap, decorations, drinks, easy, Entertaining, festive, fun, Halloween, hummus, moscato, Party, wine on October 31, 2015 by Juliana Goodwin.